Despite the recent inscription, the World Heritage Centre was informed in November 2007 that the State Party had granted to Bushmanland Minerals (Pty) Ltd a “Prospecting permit to prospect for all minerals on the portion of the farm Richtersveld No. 11”, and that the “execution of this prospecting right” had taken place at the Directorate of Mining and Energy (DME) office in Kimberly on 5 September 2007, after which a permit was received by the Bushmanland Minerals Company on 13 September 2007. A copy of a letter received by the Centre and dated 2 November 2007 informs that the Bushmanland Minerals Company “plans to send out a team to the prospecting area to commence work on Monday 5 November 2007”; that, “prospecting will initially consist of surface mapping, surface sampling and geophysical surveying and no invasive prospecting will take place at this state without further consultation with affected parties”. The letter further states that, “the Company has also been in consultation with the chairman of the Richtersveld Communal Farming Community, who is aware of our intent to commence work on 5 November 2007”. An “extract report” from the prospecting work programme showing the extent boundaries of the actual prospecting area is also included in the letter compiled in conformity with the Prospecting Right in terms of Section 16 of the Mineral and Petroleum Resources Development Act of South Africa. It is reported in the extract report that the prospecting is to be carried out for a period of five years and will consist of surface mapping, geo-chemical sampling, geo-physical prospecting, percussion and core drilling. Through a telephone discussion with the head of the Bushmanland Minerals, the World Heritage Centre was informed that the Company was not informed of the intentions of the State Party to nominate Richtersveld for the World Heritage listing. The World Heritage Centre was further informed that the Company had applied for a mining permit early in 2007 and granted in September of the same year, and that the expected prospection would include an area estimated at 83,000 hectares of the properties’ 160,000 hectares of the core zone, and including part of the 398,425 hectares of the buffer zone. The World Heritage Centre notes from the Government Gazette Notice Number 30043, dated 4 July 2007, that the Government had issued a Proclamation (no. 563) of the Richtersveld Cultural and Botanical Landscape as World Heritage property following the decision adopted by the World Heritage Committee at its 31st session (Christchurch, 2007). It further notes that the Government issues two months after the inscription a mining prospecting permit for the property. The World Heritage Centre further notes that in a National Treasury “Special Adjustment Budget Speech 2007/08” of 12 September 2007, the Finance Ministry reports to have signed, on 22 April 2007, a “Deed of Settlement” in the land claim made by the Richtersveld community, and subsequently approved by the Cabinet in relation to diamond mining and outlining the roles of Alexkor, the State owned mining company and the Richtersveld Mining Company, giving the Richtersveld community 49% of Alexkor and the State, 51%. It is in this relation that the Bushmanland Minerals Company had contacted the World Heritage Centre, informing that it had been given rights to prospect within the 51% share. Following the World Heritage Centre’s expressed concern to the State Party, the Department of Environmental Affairs and Tourism (DEAT) informed the World Heritage Centre through an e-mail dated 28 March 2008 that it was investigating on the matter, and that on 5 March 2008 it had met with the Bushmanland Minerals to inform them “about the potential negative impact that their activities could have on the property, and the fact that no mining or prospecting activities were permissible in a property, in terms of the National Environment Management and Protected Area Act” of South Africa. The World Heritage Centre has been informed through an e-mail dated 28 March 2008 that a meeting is being planned to take place between DEAT and DME with the objective to request DME to withdraw with immediate effect the mining permit granted to Bushmanland Minerals. 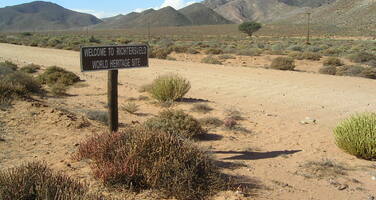 The Conservancy management of the Richtersveld has also proposed the need to start up a dialogue between the Richtersveld Community Conservancy, the DEAT, DME, Community Property Association and Richtersveld Municipality in order to work out a lasting solution concerning the World Heritage property and its buffer zone. In line with these discussions, the World Heritage Centre understands that the State Party is concerned not only in the Richtersveld Cultural and Botanical Landscape but also in other World Heritage properties such as the Cape Flora Region Protected Areas, Fossil Hominid sites of Sterkfontein, Swartrans, Kromdraai and Environs, and Mapungubwe Cultural Landscape to streamline the emerging issues concerning boundaries, human use systems and other developments. The World Heritage Centre and the Advisory Bodies encourage the State Party to continue with its efforts and particularly to use modern methods to delineate properties and to promote community participation in conservation especially in a multi-stakeholders environment. 8. Also requests the State Party to submit to the World Heritage Centre, by 1 February 2009, a report on the State of Conservation of the property for examination by the World Heritage Committee at its 33rd session in 2009. 11. Also requests the State Party to submit to the World Heritage Centre, by 1 February 2009, a report on the state of conservation of the property, for examination by the World Heritage Committee at its 33rd session in 2009.